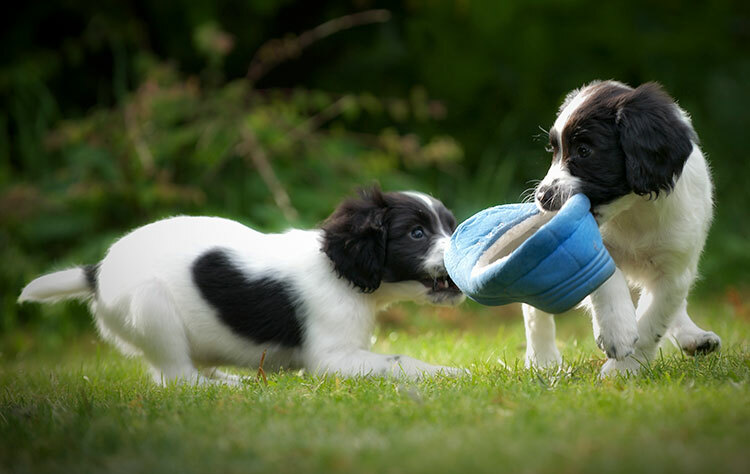 How to puppy proof your house: puppies are great at exploring and you can guarantee it won't be long before their curiosity leads them into trouble. So strike first and puppy-proof your house and garden before he arrives. By using a puppy den you will have somewhere you know is always completely safe for your pup but you still need to take a look at the rest of your home. Remove or adequately cover exposed cabling, especially mains electricity leads. These will be very appealing for a teething puppy, consider covering with a bitter apple chew repellent if covering the cable isn't possible. Make sure that ornaments and items that are breakable or heavy are not able to be knocked over, especially where they could fall and cause injury. Protect exposed furniture/wooden floors/fabrics that are at risk of being chewed or scratched easily. Remember, your dog will find it hard to stop if they're running onto a slick surface, so make sure that they're adequately protected from causing damage to both themselves and your property. Clear glass doors are also going to cause issues for an excited new canine! Consider purchasing a stair-gate. It will allow you to easily block access to areas that are out of bounds whilst still allowing for the puppy to feel involved in the household and easily accessible for you. Move hazardous and toxic household products, such as bleach, to a secured storage area. A cupboard door poses little challenge to your new arrival! Keep your toilet lid closed, and it may be worth putting a latch on the lid. Finally agree on some house rules - for example, toys not to be left on the floor when the pup is about. Also teach any children basic handling skills with a soft toy and explain when they need to leave him alone.